The night was lonely and misty with a strange energy to it. It was 9 pm on Saturday. Nicola, Matsuko, Shirley and Candice, all 15 (except Candice, who was 16) were having a sleepover. 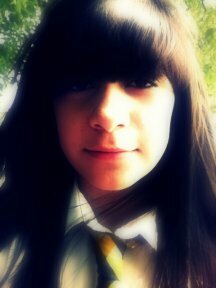 Nicola had short jet black hair with a full fringe. Candice was a beautiful blond, and people would always be jealous of her looks. Shirley was a redhead with her hair falling down to her waist. Finally, Matsuko was Japanese with black hair, and she always wore purple contacts because she wanted to be different from the crowd. They were all in Shirley's bedroom. Her bedroom walls were orange and mostly had orange items and decorations in it since this was Shirley's favourite colour. Her bed was in the corner of the room and her walls were covered with posters of various artists. The rest of the girls had brought their own sleeping bags. Candice had already fallen asleep, while Matsuko was looking through her bag and Nicola was chatting to Shirley. "Hey, Shirley, do you mind if I use your laptop?" Matsuko asked. "Sure you can, but why?" "Oh, I just need to finish that homework assignment we got this week. It's due on Monday and my computer broke down. It just started typing random keys. I have my memory stick." Matsuko pulled out a memory stick from her bag with a slight smile on her face. "Ok, but it's downstairs," Shirley replied. "I'll go get it quickly." She hurried out of the door. Nicola turned to Matsuko with a curious look on her face. "Matsuko, what do you mean by random keys exactly?" "Well, it just started typing on its own ..." She stopped and thought for a second. "Well, to be exact, it just typed d ... o ... olb over and over again." Nicola's expression suddenly changed to a mix of curiosity and shock. "That's exactly what happened to my computer 2 days ago!" "It could just be a coincidence, you know, or some computer bug that you both got," explained Candice in a tired voice. "Candice, I thought you fell asleep," Nicola said. "Ya, I was but I had a freaky nightmare and woke up." The sound of Shirley's steps coming up the stairs grew closer and closer. "I'm back! Here you go," she said enthusiastically and handed her laptop gently over to Matsuko. She then noticed Candice looking up at her with her adorable green eyes. "Oh, you're awake!" Candice just bobbed her head up and down, yawning at the same time. "What were you guys talking about while I was downstairs?" Shirley asked. "Well, them two said they're computer broke down the same way. Their computers kept typing d ... o ... om ... d over again." "Well, anyway, I suggested it was probably a bug." Meanwhile Matsuko had already started the laptop and started typing. "What in the hell, you have the computer bug too?" Matsuko questioned. Suddenly the lights went out and everything was pitch black. The night became silent and had been tainted by something unpleasant.